I live, work, and pray among prophets. Not the camel-hair-and-locusts or the bushy-beard-and-divine-judgement varieties. My prophets are six nuns who individually and collectively love more deeply than anybody else I’ve known. The Visitation Sisters of Minneapolis are prophets and pioneers. Responding to whispers from the Holy Spirit, my Sisters uprooted their monastic stability in St. Louis and St. Paul in order to move to the “hood” of North Minneapolis, a neighborhood marked in the media and popular opinion as a ghetto of guns, drugs, and prostitution. 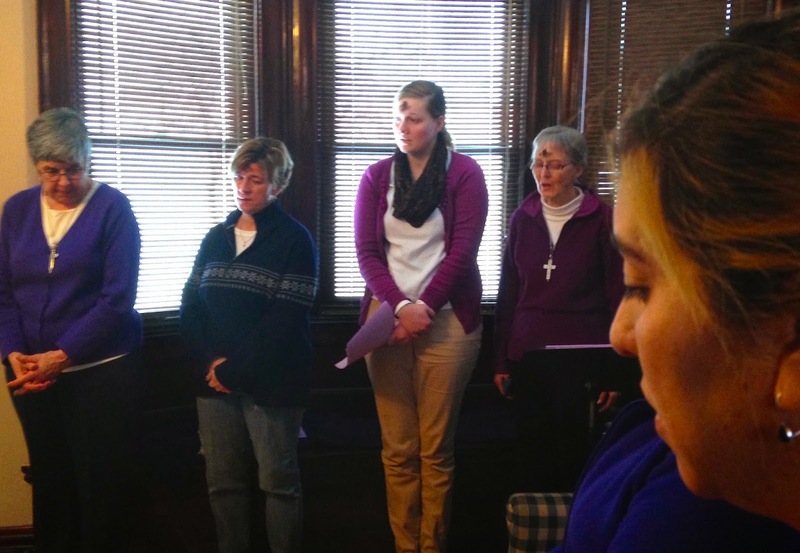 These women moved to the racially, religiously, economically and culturally diverse northside in order to pray contemplatively and to be a non-violent presence. Not to found a clinic or a school, an agency or a program. To pray and to be. In doing so, these six nuns have revolutionized my understanding of God, of service, of love. They engage with their neighbors, not as wise elders (which they are) or trained theologians (which they also are), but rather as friends of God (which we all are.) Whenever the door bells, the Sisters answer it, confident that they will meet God in the person of their neighbor at the door. On Ash Wednesday, the Sisters listened once more to the whispering of the Holy Spirit and took another leap of immense faith. 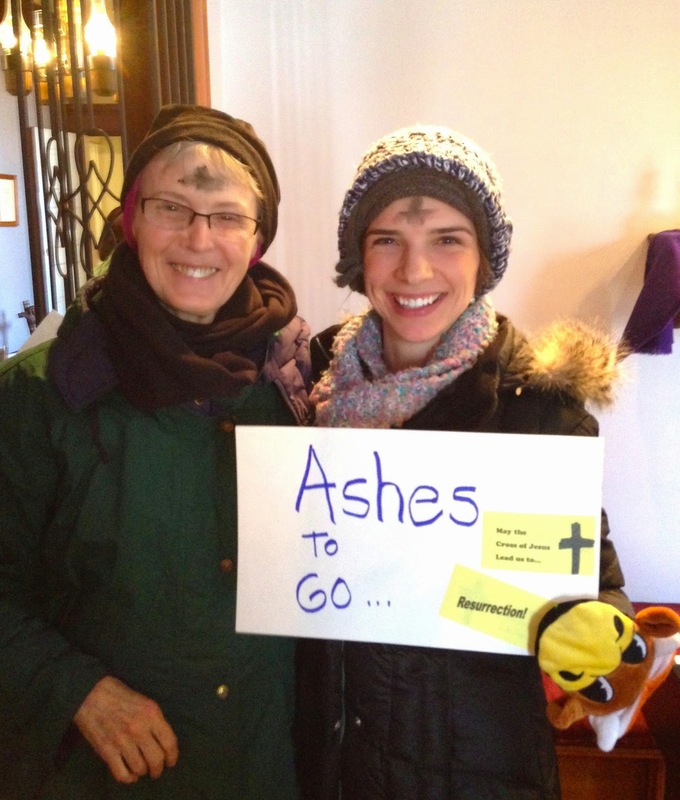 We brought ashes–the ancient Christian symbol of rebirth, renewal, repentance–beyond the monastery walls and into the streets of our neighborhood. We brought ashes to our neighbors not because we believed ourselves somehow holier than our neighbors. We brought ashes to the streets because our humanity and our neighbor’s humanity are intricately bound together in God’s plan for salvation. We do not come to God alone, but as a whole beloved community, bruised and broken, forgiven by a God who loves us fiercely and passionately. So many of our neighbors looked at us a little funny–these mostly white, mostly women–people pouring out of the monastery and asking to smear ashes on foreheads. Many of our neighbors are not Catholics, Anglicans, Lutherans, or other traditions that celebrate Lent and Ash Wednesday. Many of them are not Christian or were once Christian, but have not practiced in a very long time. Some people were hostile, assuming that we were proselytizing or hounding people about their sins. Many were receptive, eager even to have a nun or somebody associated with the nuns smudge a little dirt and tell them that they were forgiven, that God loved them, that no matter how big or how many their sins, God would always forgive them. 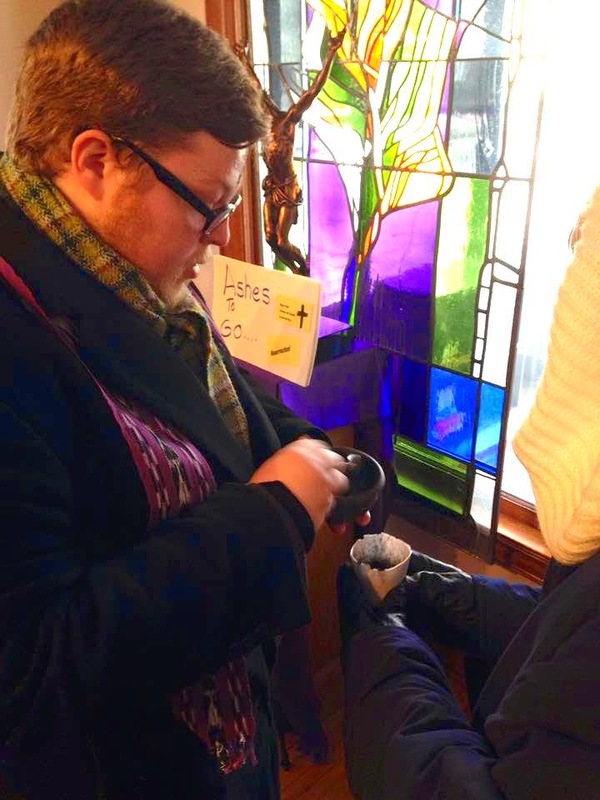 Ash Wednesday Mass in the monastery. That’s the power of the Gospel right there. God-in-Jesus meets us, not as divine judge and sinful penitent, but as human and human. In his Treatise on the Love of God, St. Francis de Sales, co-founder along with St. Jane de Chantal of the Visitation, tells us that God planned to become human in Jesus, not because of our sinful nature, but because of God’s supreme love of humankind. Francis writes of God’s desire to “communicate [Godself]…in such sort that [humanity] might be engrafted and implanted in the divinity, and become one single person with It” (Treatise, Book II, Ch. IV). Taking ashes to the neighborhood taught me that God never forgives us begrudgingly, because God desires communion–union with–us. Our sin sometimes gets in the way of our relationship with God, but God quickly scrambles to forgive us and wipe all of that sin away. The ashes, blessed and distributed annually, are a reminder of our rebirth in the waters of baptism, of our being marked as Christ’s own forever. What to submit your own volunteer reflection or program article? Email Larissa Dalton Stephanoff at [email protected].